The Spanish government has taken the first steps to hire a Belgian firm of lawyers in order to ‘defend Spain’s interests’ in the judicial process in Belgium against Spanish judge Pablo Llarena, according to a statement on Sunday. The magistrate has been summoned to appear in a Belgian court on 4 September. In June, Catalan pro-independence leaders in exile led by Carles Puigdemont announced they had filed a lawsuit against Llarena, who had been in charge of the inquiry stage of the independence case at the Supreme Court. The reasons behind the lawsuit include the fact that, according to them, their rights to ‘an impartial and independent judge’ were violated, as well as their right to a ‘fair trial’ and ‘presumption of innocence’. The Spanish government said on Thursday that it would defend Spain’s justice, but not the ‘private acts’ of Llarena, such as some remarks he made to the press, included in the lawsuit put forth by Puigdemont and his ministers. However, in a second statement on Sunday it said it would defend the judge, and this time made no reference to his ‘private acts’. These different statements remain surrounded by controversy, as the hardline unionist parties, Ciudadanos (Cs) and the People’s Party (PP), have accused the Spanish socialist (PSOE) government of ‘abandoning’ judge Llarena. ‘What does it mean that the Spanish government does not defend the Supreme Court when its impartiality is questioned by a fugitive in another country? It only responds to the fact that Sánchez [Spanish PM] is at the hands of the nationalist parties,’ said a Ciudadanos spokesman. 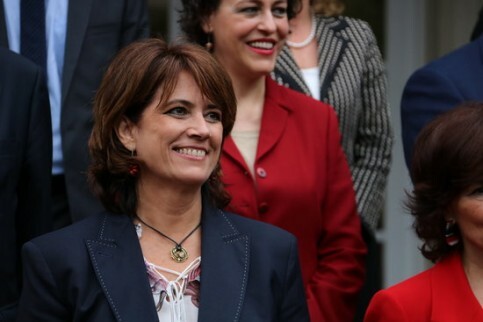 Both Cs and the PP have asked the Spanish Justice Minister, Dolores Delgado, to appear before the Congress to give an explanation. The PP’s president even said on Monday that Spain’s prosecutor should file a lawsuit against the Belgian court, which has accepted Puigdemont’s lawsuit for consideration. Mainstream pro-independence parties have also criticised the Spanish government, but for completely different reasons. Esquerra‘s MP in Madrid Gabriel Rufián said that the Spanish executive defending Llarena ‘attacks everyone’s civil rights’. PDeCAT‘s spokesman in the Spanish Congress Carles Campuzano claimed that the Socialist government has ‘become intimidated’ by the right-wing parties pushing it to take action in favor of the sued judge.